Three subjects were skiing the Catamount Trail starting at Bolton Valley and ending at Nebraska Valley Road. When they reached the downhill section they found conditions too difficult to continue and were overcome by darkness. They had no lights and called for assistance. Location was determined to be a short distance below the junction with the JK Trail. 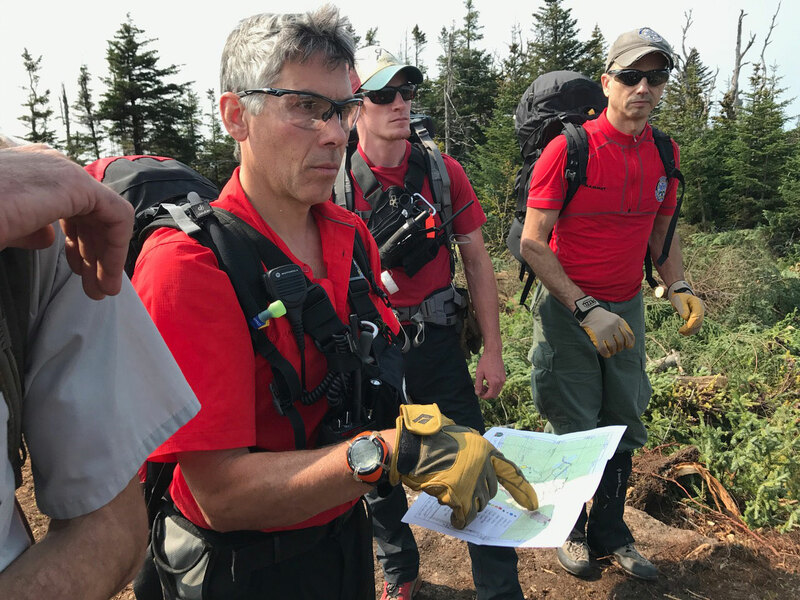 A hasty team from Stowe Mountain Rescue was sent up the Catamouth Trail from Nebraska Valley Road and assisted the subjects back to their car. Waterbury Back-country requested assistance with a patient on Camel’s Hump, upper Monroe trail with compound lower leg fracture on an icy trail. Total of 6 teams with total of 26 rescuers. Patient Care & Field Operations by camels hump Back-Country. The litter carry required many passes and several rope systems due to the icy terrain. The weather was dynamic, slight rain, winds, distant thunder / lightning, sleet, snow, nothing. Patient delivered to Waterbury Ambulance ~1:30 AM 11/10. A party of 4 hiked up Gondolier (Gondola lift line) leaving the base at ~1430. The party consisted of three-18 year-old males and a middle-aged woman. The woman returned to the base after an hour of hiking and the 3 males continued to the Cliff Trail and the Chin of Mansfield. They were very poorly dressed, wearing only shorts & cotton sweat shirts. Temperatures were in the 40’s with gusty wind and the mountain was completely socked in with very limited visibility. When the party of 3 did not return by 1730, the resort called 911 requesting a search by SMR. VSP notified. A Stowe Mountain Rescue hasty team was being deployed to the Cliff Trail when one of the subjects texted they just exited the Cliff Trail and were at the Cliff House (1800). They were instructed to wait there and a UTV was dispatched to pick up the party. They were returned to the base without incident (1850). A group of four were scrambling in the gullies and cliffs above the main parking lot in Smuggler’s Notch on the “Old Smuggler’s Face.” The party climbed to a point where they could no longer proceed or retreat and became stranded. Three of the four subjects were stranded together a short climb above the talus and one subject was higher on the cliff on a small ledge. Cambridge Fire Department established Incident Command, Cambridge Rescue staged for medical support and Colchester Technical Rescue staged as a Rapid Intervention Team in the event of an injury. Stowe Mountain Rescue fielded three teams: Team 1– Access the subjects from below, Team 2 — Access the subjects from the top of the cliff, and Team 3 — Stage at the bottom the “Grand Confusion” ice climb to wait for additional instruction as teams 1 & 2 surmised the situation. Team 1 (3 Rescue Climbers) located, accessed and secured the three of the four climbers with helmets and harnesses. Two personnel from team 3 assisted with the evacuation of this group who were safely delivered to the Command Post in the parking lot. Two team members from Team 1 continued climbing in an attempt to access the fourth subject, but ultimately abandoned accessing the subject from below due to hazards and unsafe climbing conditions (this team continued their safe climb to the top of the cliff). Team 2 located the subject from above and the two Team 1 climbers joined Team 2. A single rescuer rappelled to the subject and secured the individual with a harness and helmet. Due to the same conditions that prevented access from below, it was determined the safest evacuation route was back up to the top of the cliff. The two remaining members from Team 3 joined Teams 1 and Team 2 (at the top of the cliff above the fourth subject) and together established a raise system to bring the rescuer and subject up to the top of the cliff. The evacuation was completed without incident and all parties safely arrived at the Command Post/Parking Lot.